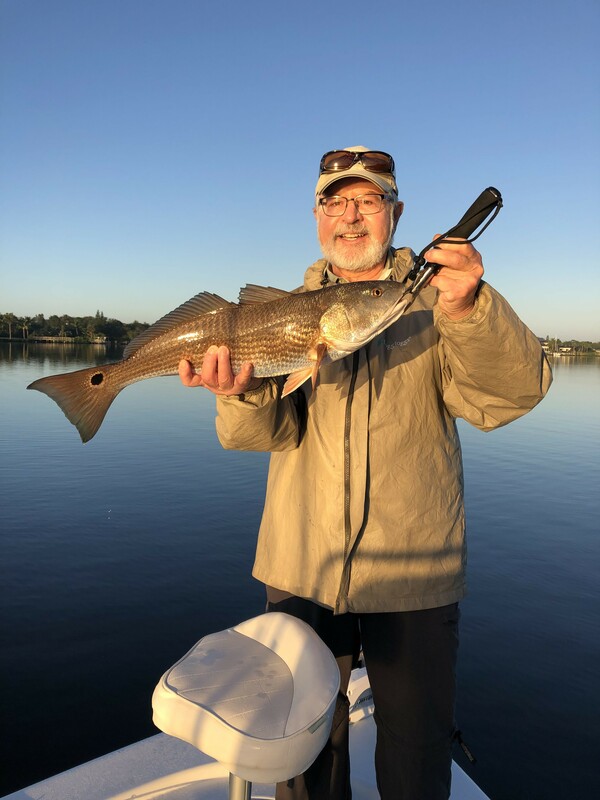 The winter continues with some good light-tackle fishing in the River near the St. Lucie Inlet. 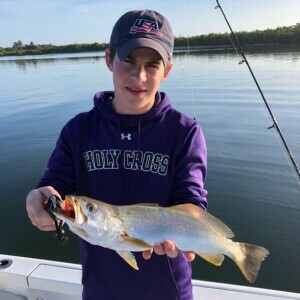 The “back country” fishing can be best this time of year, targeting fish in the North and South forks of the St. Lucie River. Most of our local snook move back there during these cooler months. We’ve also been catching redfish and trout back there mostly using DOA CAL Jigs. My favorite colors are bright green (aka chartreuse). When using these jigs along the mangrove shorelines, simply cast close into the mangroves and use a medium/slow retrieve with slight jigging-twitch. The colder the water, the slower the retrieve. When snook fishing the bridges, we use “First Light Snook Jigs” along the bottom. After sunset, cast a 1.5oz or 2oz jig up-current (or an angle up-current) and retrieve down with the current making an occasional quick jigging jerk motion. The big snook will often be close the bridge abutments and channel fenders. 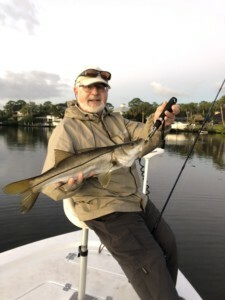 Snook season opens on February 1st and this is a good method to catch slot-sized 28-32 inchers. The pompano bite continues through February for surf-casting and inshore jigging the bridges and flats. Outgoing tide has been best inshore for the bridges, crossroads, and inlet flats. 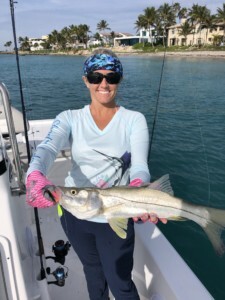 Wading the Sailfish flats for pompano can be lots of fun near low tide, especially for fly-fishing, with the possibility of other fish such as trout, redfish, bonefish, jacks, and more. Bucktail jigs work great on the flats along with Gold Spoons and DOA Curly Tail Jigs. We’ve lately come across lots of sand-trout in the channel of the ICW and caught them using live shrimp on a chicken rig. There’s also been a great tripletail bite for anglers drifting live shrimp close to crab trap buoys and channel markers. The 3-6 inch pilchard baits will show up more through February and can be found along the shoreline of the ICW and near boat ramps, islands, and flats. Early in the morning, they look like rain drops on the surface with a 20 foot diameter. I use a 8 foot 3/8 inch cast net. One throw and the livewell is full.